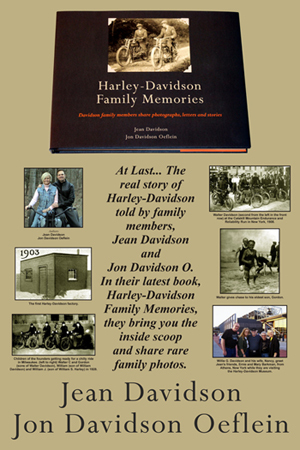 Come Take a Journey through time with personal stories and rare family photos of the Harley-Davidson founders and their families. This is the personal story of the history of Harley-Davidson motorcycles that only a family member would know. How four boys with a dream, lived worked and played developing the Harley-Davidson motorcycle that is now loved all over the world. What it was like growing up with the racers in the kitchen and what happened during the not so good years. 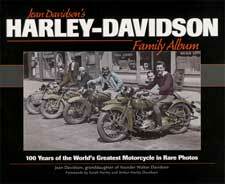 100 years of the World’s Greatest Motorcycles in Rare Family Photos Jean shares personal Harley-Davidson history and lore and never before seen photos from the Harley and Davidson family collections. It includes photos and reminiscences from Sarah and Mary Harley (Two granddaughters of the original William S. Harley). There are over 200 photos in this collector book.